In these difficult days of escalating house and land costs and acute shortage of properties to rent, unlucky homeseekers become desperate, ready to grasp for any other likely alternative. 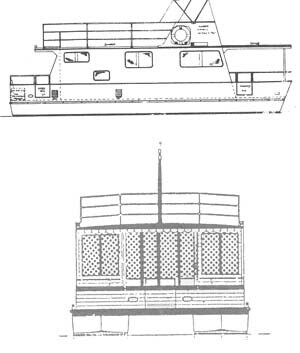 An obvious and exciting answer is the houseboat, which, when constructed from build yourself plans, full size patterns and instructions, costs only a fraction of a small suburban home complete with allotment. Great advantage of the houseboat is that you can change your neighbors and scenery at will, just by a touch of the start button! The pontoon houseboat "Rivermaid" can be built in any length from 30 to 40 ft. with choice of materials including steel, plywood, fiberglass, aluminum or steel. It takes relatively little power to move "Rivermaid" owing to the narrow, yet buoyant pontoons of her tunnel hull design. A 75 horsepower outboard should give an estimated 9 knots and twin 55's or 60's approx. 13 to 14 knots. Hulls are connected with a steel framed structure in both plywood and steel versions. Plans & Patterns Only $99, Was $225.